The drought is finally over for Cuthbert house, after winning today’s annual Secondary Cross-Country carnival. Students aged 12+ walked, jogged, ran and danced their way around the course, with participation stronger than ever. House spirit was alive and well, with competitions ranging from war cries to fly to keep things buzzing. 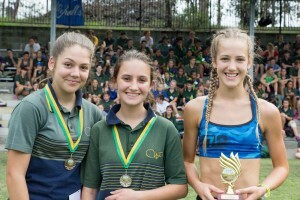 The notoriously hilly course was dominated by Nina Brown (pictured below, in blue), who broke a long-standing 15 year girls’ record by more than a minute. Sport Co-ordinator, Lynda Williams was very impressed “she broke a 10 year record. Nina is an amazing runner who did her house proud.” The 15 Years Girls’ Age Champion, running for Cuthbert house, joins Westside’s long list of state and regional athletics representatives. Nina Brown (in blue, right) breaks long-standing Girls’ cross-country record. The strong performance by all runners this year has been greatly assisted by the leadership of marathon runner and College Principal, Barry Leverton, who personally runs training sessions throughout the year. Twice weekly, he and the students run the track around the Secondary campus. He also runs with Primary students on their campus, just across the road. All the houses are now focussed on next term’s Inter-house Games and the Athletics Carnival. Westside Christian College congratulates all of its students on a successful Cross-Country carnival.